I spent Saturday, April 15th, 2017 in FOOD ROOM among people who share the love of both food and cooking. This class was such extraordinary and pleasant experience! I've spend Saturday night in Marbella learning how to cook, eating and communicating with amazing people in a lovely ambiance. It is the best way to spend your time and money for quality dinner, fine liquor and socializing. 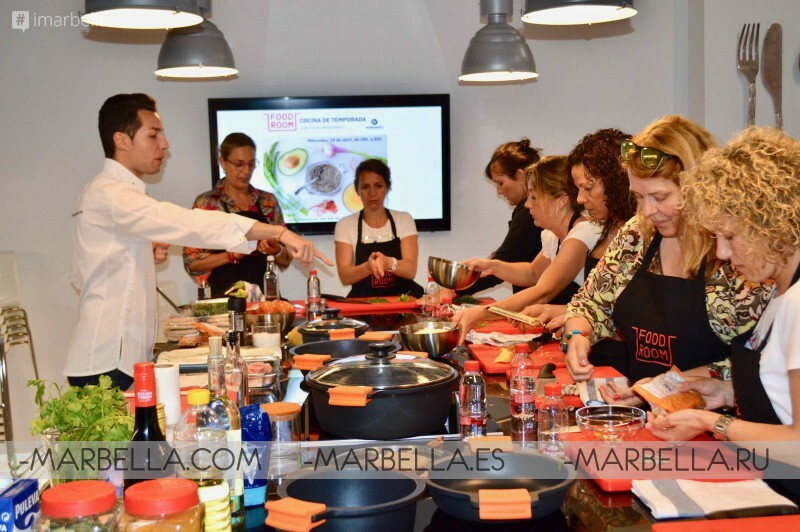 Cooking course was Mediterranean Cuisine in Spanish and the star chef of the night was Manu Balanzino. 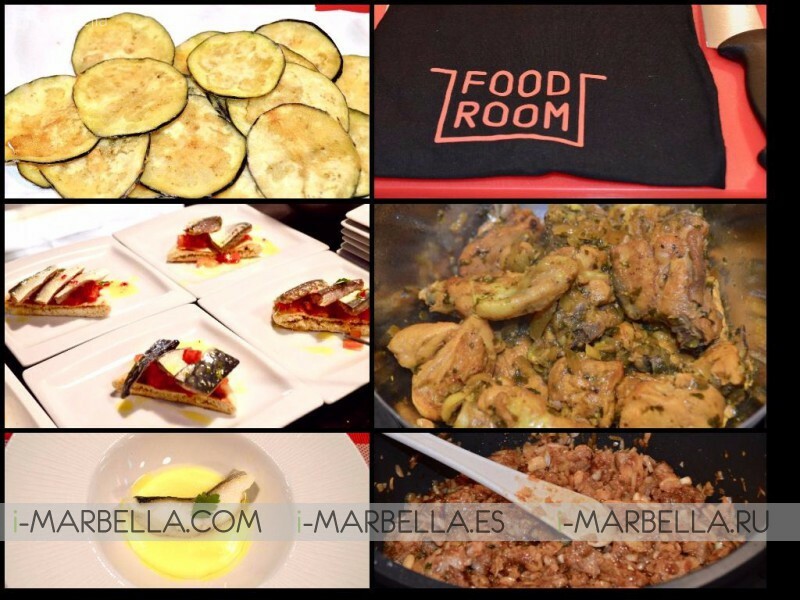 FOOD ROOM is located in San Pedro del Alcantara, Marbella, Malaga, Guadalmina Alta Commercial Centre, just a few kilometers from Puerto Banus, Marbella. FOOD ROOM offers modern facilities with the most up-to-date equipment. *Lamb with Pastoril (“especially of land or a farm”) with Dried Fruit. In case you are wondering what AOVE is here is a definition: ” Olive oil of the highest category is obtained only from olives and only by mechanical procedures, no chemical extrations were made. Its aroma and taste reproduces the taste of the olives of which it is made, and contains all curative and nutritious properties of this excellent natural product. Virgen- Extra oil is the best natural olive juice which can be presented either filtered or “raw”. Even if you dont speak perfect Spanish you can understand everything and people in Marbella are so international that comuncating with each other is so easy. There were 10 people all from nationalities around the world: Belgiam, American, English, Estonians, Spanish etc. I enjoyed that the chef Manu Balanzino was showing the students and instructing how to prepare the ingredients for the dish. Students minced garlic, zucchini, meat, tomatoes, potatoes, fish, onions, parsley. We prepared the chicken, dough sheet and all that is intended for baking. Once we were finished and the food was served, we ate together around the table, and this was the most satisfying moment for everyone. This cooking course is meant to be three hours long, but the group was having a lot of fun and it took over 4 hours. I met new people in Marbella and had incredible Saturday night with Gourmet food and quality drinks. 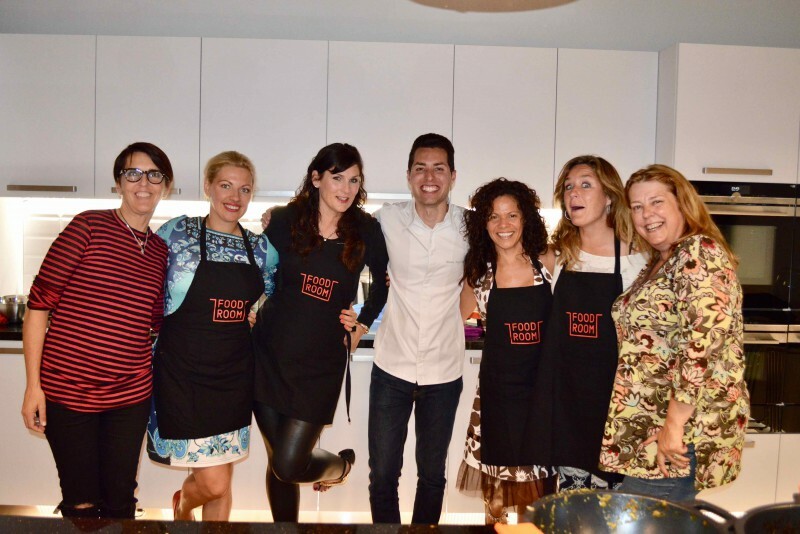 FOOD ROOM Cooking school is a fantastic way to meet people and enjoy quality time. FOOD ROOM is your new cooking school also pastry and bread making, wines and cocktails. FOOD ROOM is Cooking & Tasting School where the regular offer is based on participative courses and workshops on all types of cooking, pastry and bread making, wine tasting and cocktails. The courses designed for food lovers, both residents of the Costa del Sol, as well as tourist who are attracted here by the gastronomic richness of Spanish country. FOOD ROOM training sessions will, therefore, be delivered in Spanish and English. FOOD ROOM has the ideal space for holding all types of events, whether birthday parties, business meetings, product launches, team building sessions and so on. The courses include all beverages, the recipes that will cook, and all the food ingredients and equipment needed to prepare delicious dishes that you will also be able to eat! There will also be show cooking and master classes done by highly respected chefs and all kind of courses like Food Writing, Food Styling and Food Photography. Courses taught in English appear in the English section on our web. Nevertheless, we have included our Spanish-speaking classes too just in case you would like to attend. Cooking, baking, and tasting is more a sensorial experience than examining your level of Spanish! Annika Urm is a journalist, blogger, the director of i-Marbella.com, and her job is to report emotional experiences and facts in the best possible way. Annika is a modern entrepreneur, a business lady of high standards and exquisite taste. Annika's incredible performance is best described in her numerous followers (more than 100,000.00 each month). FOOD ROOM begins March 29, 2017! Find your course!